The drams, cocktails and tours continued to flow into day three of the Spirit of Speyside Whisky Festival 2018 (3-7 May), but there was plenty more to offer visitors. Canoeing down the Spey followed a world-class live music? 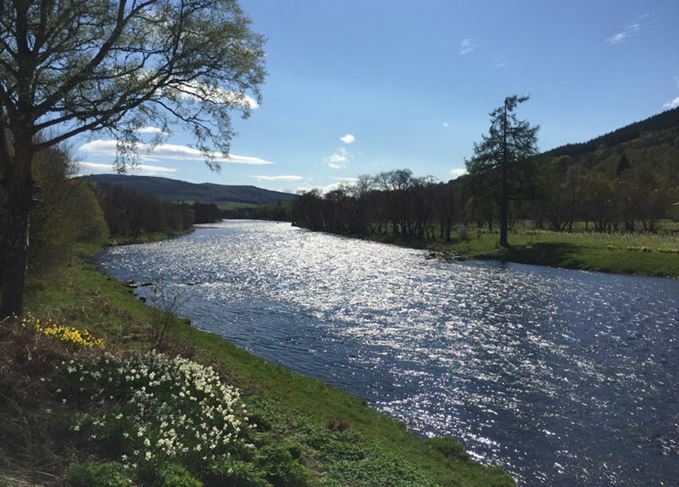 Becky Paskin reports from bustling Speyside. ‘It’s far busier this year’, seemed to be the mantra of visitors and whisky industry folk at Spirit of Speyside this week, as thousands descended on the region’s distilleries and attractions. It’s no wonder so many flock to Speyside during the festival, with so much to see, do and taste it’s an unmissable feast for whisky enthusiasts. Activities on day three continued to be diverse, with river canoe tours, whisky speed dating and live music festival Dogfest keeping visitors entertained throughout. The sunshine even played its part, with temperatures soaring above the need for a jacket. Here’s a taste of the highlights from day three. Don’t forget, if you’re at the festival tag #dram18 and you could see your photos appear here too. New whisky: Alan Winchester, master distiller of The Glenlivet, introduced the distillery’s new single malt whisky, The Captain’s Reserve. Matured in a mixture of ex-Sherry and Bourbon casks, and finished in Cognac casks for at least six months, it is available to buy now from the distillery and select retailers (Photo: Sean Murphy). Whisky Tinder: One of the new events at Spirit of Speyside this year was Whisky Speed Dating, an opportunity for visitors to get up close and personal with five whisky celebs over a dram. In this case the names included brand ambassador Ian Logan, The Glenlivet distillery manager Trevor Buckley, master distiller Alan Winchester, technician Billy Wright and former manager Bill Lamb. Whiskies included The Glenlivet XXV, and a 1970s 12-year-old bottling (Photo: @whisky_emissary). Birthday bonanza: Tamdhu marked its 120th birthday during the festival celebrations with an exclusive distillery tour and tasting of its new limited edition bottlings, Dalbeallie and Team Single Cask. Global celebration: The tasting, held in the distillery’s filling store, was streamed live across Facebook and Twitter as bloggers around Europe joined in with distillery visitors with samples of their own. Tight fit: Tamdhu is not usually open to the public, so squeezing around 100 visitors through its mash room and still house – all guided by distillery manager Sandy McIntyre – was quite a feat. Life’s a beach: Arrive at Craigellachie Beach at 6.05pm and you’d have missed out on a selection of high-end pours from Dewars ambassadors Georgie Bell and Andrea Montague. The very new bottling of Craigellachie 51-year-old disappeared within minutes as hundreds of visitors flocked to the riverside. The ‘Scottish Aperitivo Hour’ will return again this evening however, with drams including Craigellachie 13-, 19-, and 31-year-olds, plus Aultmore 25-year-old. Don’t be late! Village idiots: Sam Simmons of Master of Malt (pictured left), Nicholas Morgan of Diageo and Ian Millar of William Grant & Sons (right) returned to defend their title in Scotchwhisky.com’s Battle of the Villages, held at the Craigellachie Hotel, as Dufftown took on Aberlour. Five blind-tasted drams later and Simmons, Morgan and Millar walked away with the title once again, leaving Aberlour representatives Donald Colville and ex-Diageo distillery manager Willie MacDougall out in the cold (Photo: Till Britze). Malt & Music: One of the highlights of the Spirit of Speyside is Dogfest, the festival of music held at the Craigellachie Hotel in collaboration with Copper Dog whisky. A regular fixture of the festival is Barley, Stills, Mash & Tun (aka @thewhiskyband), comprised of five members of the whisky industry from writers to blenders and brand managers who ‘blend 75 hit songs from the last 50 years, making you dance on dram at a time’. Raucous pub quizzes, toasting Talisker marshmallows on a bonfire and Tormore’s model.